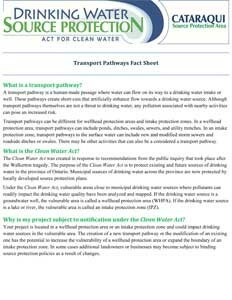 A transport pathway is a human‐made passage where water can flow on its way to a drinking water intake or well. These pathways create short‐cuts that artificially enhance flow towards a drinking water source. Transport pathways themselves are not a threat to drinking water, but any pollution from nearby activities can pose an increased risk. Transport pathways can be different for wellhead protection areas and intake protection zones. In a wellhead protection area, transport pathways can include ponds, ditches, swales, sewers, and utility trenches. 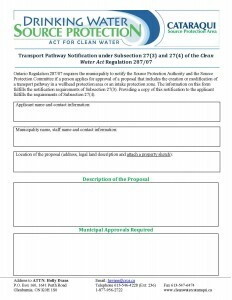 In an intake protection zone, transport pathways can include new and modified storm sewers, and roadside ditches or swales. Development projects that could create a new transport pathway or modify an existing one will need to be reviewed by the Cataraqui Source Protection Authority to determine whether the proposal will impact the vulnerability of the wellhead protection area or the boundary of the intake protection zone. 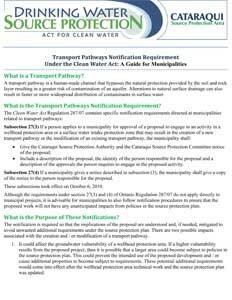 Municipalities are responsible for screening development applications and notifying the Cataraqui Source Protection Authority about potential transport pathway creation or modification.